Place the Heartwood Songbird Station Bird House with Verdigris Roof in your yard for a dramatic and inviting roost for your feathered friends. The streamlined shape brings a classic look to your garden with ease, while its durable construction lends the unit a modern touch. The elongated, rectangular body creates a welcoming roost for songbirds, and a 1.5" diameter entry hole sits on the front panel for them to access it. A 1.5" wide ledge at the base of the home offers perching and landing spots, while a significant, verdigris copper roof protects the nest from the elements. A wooden, rounded white finial tops the item, bringing graceful curves to this angular home. Made from lasting, cellular PVC, this shelter is sure to remain beautifully white for seasons of use, and will not crack, warp, or absorb any moisture for use in a variety of settings. Its attached mounting collar allows you to display the home on a 4 x 4 post (not included) easily, and four brackets on this collar add extra style and curves to the piece. 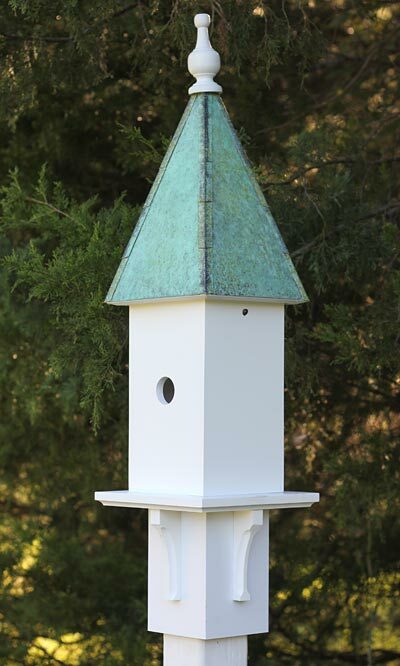 Invite bluebirds or other songbirds to roost in your backyard with this Songbird Station Bird House with Verdigris Roof. Made in the USA.